I just finished a 5.0km run that lasted about 0hh:21mm:31ss ! Really not a very nice run today. The UK is being battered by Storm Erik's strong winds, and Norwich is no exception. This morning we had about 40mph winds with gusts of 60mph; running through an exposed park with complete headwind stretches was a real struggle. I got an official time of 21 minutes 31 seconds, but about 75% of it was incredibly uncomfortable - it was definitely a 'head down', just get this effort over type of run. The impulse just to stop running and walk through the windy stretches was very strong, but I'm trying to give myself the mindset that stopping/walking happens at the end of a run, if I'm feeling exhausted and want a breather then that's more of a reason to pick up the pace as the end of the run nears closer! On a more positive note, sensations felt great this morning and my illness has completely gone. There were moments where running at sub-4:00m/km felt easy, but the wind just prevented me from getting a better time! The final 700m I ran in 3:35m/km and I surprised myself how quickly I decided, just after running 1km into the wind, to just pick the pace up and suffer like hell for the next couple of minutes. 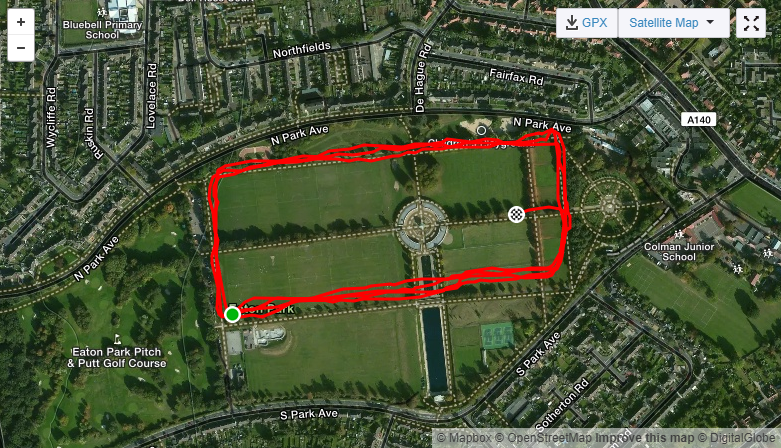 Next weekend's Parkrun will be at Andover, my home Parkrun! Looking forward to seeing if I'll be able to keep on improving on a route that's a little bit slower due to the sticky mud! A change of scenery will also be nice for my running.